Yet another drain problem solved quickly and efficiently in Clearwater, FL. Water was rising through the floor drains of a local resturaunt and I received a call from the restaraunt owner who needed emergency service. Flushing the toilet or running water in the sinks throughout the building was causing water to come up throught the floor drains. Immediate attention was required. Maintaining sanitary conditions at a resturaunt are of the utmost importance. Water coming through the drains can lead to serious health issues. This drain cleaning required that I removed the toilet in order to get proper access to the drain plumbing. I’ll do what is required to get the job done right! And I’ll smile the whole time! I take pride in doing the job right for you! After rodding the floor drains you can see all works perfectly. 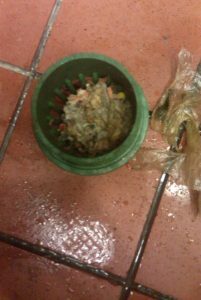 Grease buildup, food and paper products and much more contribute to improper drain flow. Resturaunt Floor Drain now working like new! Radle Rooter offers routine maintenance for discounted prices that will keep your drains operating like they should. Please call to get on our routine maintenance program.